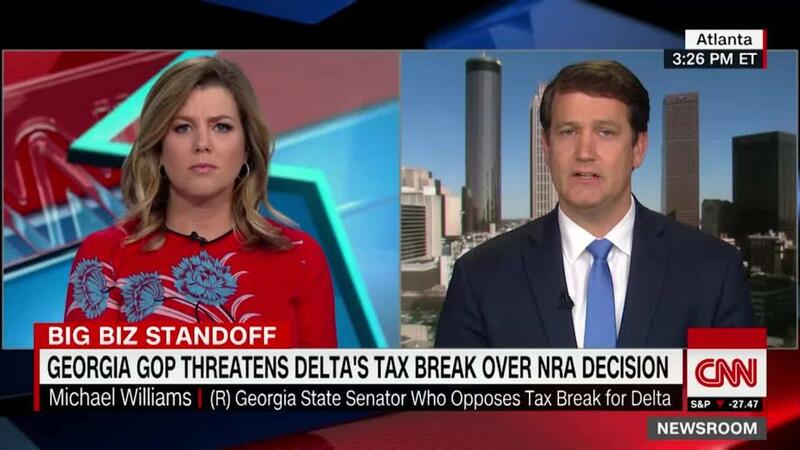 Georgia's governor says he would sign a bill depriving Delta (DAL) of a hefty tax break — a change made by Republicans after the airline cut ties with the NRA. Governor Nathan Deal, himself a Republican, said the legislation had been put at risk by political "antics." But he said he would sign it anyway because it cuts taxes. "Disagreement on key issues of our time should not prevent Georgians from keeping more of their hard-earned dollars," he said at a press conference Wednesday. Republicans in the state Senate stripped a tax exemption for jet fuel out of the bill after Delta ended a discount for NRA members flying to their annual meeting. The exemption would save Delta as much as $50 million. The bill could go to the Senate floor as early as Thursday. It still has to go back to the House before it goes to the governor. Deal said he would find "a pathway forward for the elimination of sales tax on jet fuel, which is non-negotiable." Lieutenant Governor Casey Cagle, a Republican who is running for governor, said earlier in the week that companies can't "attack conservatives and expect us not to fight back.". Delta has yet to respond publicly to the lawmakers.